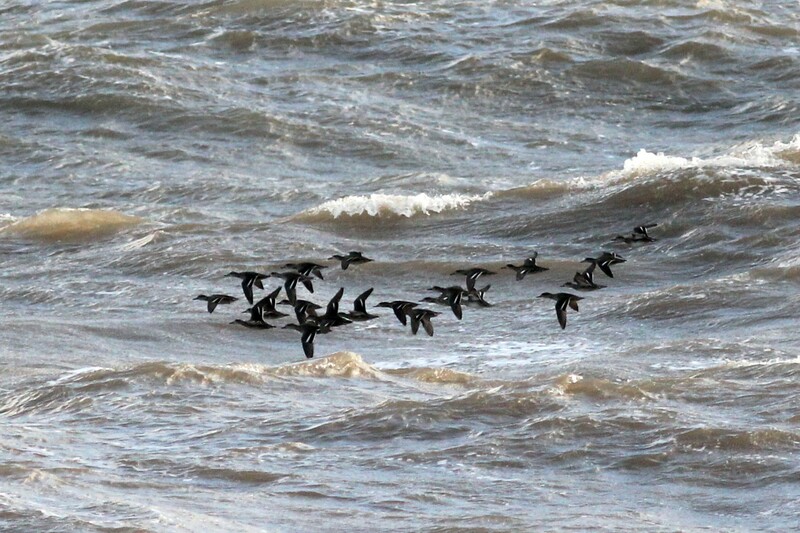 On Saturday 27 October, with a rising tide and a gale-force northerly wind, conditions for sea-watching proved to be ideal on the Yorkshire coast, producing a particularly substantial movement of seabirds and wildfowl off Hornsea. 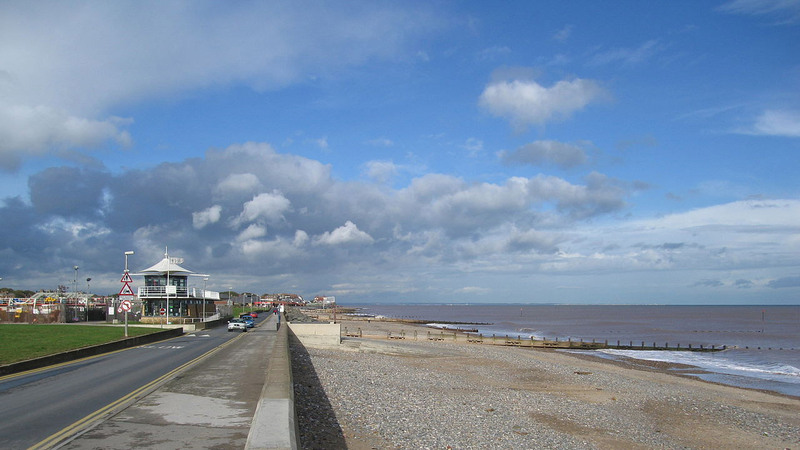 Hornsea, where I watch from, lies in a bay between Flamborough Head to the north and Spurn Point to the south. Offshore movement often involves birds passing well out to sea, as they track at distance between these two sites. However, the weather conditions of heavy rain out at sea, including some torrential downpours, intense squally showers and hail, certainly worked wonders and I was fortunate in being able to shelter from the worst of the wind and remain relatively dry throughout. Hornsea seafront: the promonotory of Flamborough Head can just be made out on the horizon (Tom Corser/www.tomcorser.com under Creative Commons 2.0 license). 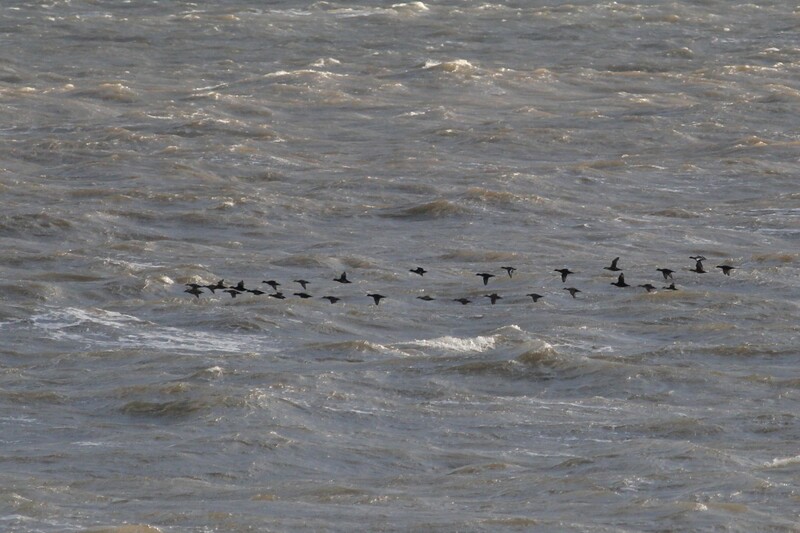 Pomarine Skuas were moving in earnest, clearly affected by the adverse weather and I was amazed to record several groups heading quickly southwards towards Spurn. The sheer size of these groups was spectacular indeed as birds reacted to short-lived improvements in the weather. An initial group of 85 birds heralded the start of more to follow, with groups of 71, 32, 22, and 21 birds continuing to move through. Pomarine Skuas were moving in earnest, with a mind-boggling day total of 515 logged for 27th, many of which were adults retaining their 'spoons' (Jonathan Farooqi). By mid-morning I started to observe birds heading north, into the headwind and approaching much closer. Three of these groups consisted of 17, 14 and 11 birds, being mainly adults with many retaining their 'spoons'. This northerly movement lasted into the afternoon but with much reduced numbers. The final tally involved an amazing 515 birds with 380 passing south and 135 north. Additionally, two adult pale morphs moved west inland in the direction of Hornsea Mere. Of the other species seen during the 9.5-hour watch, 67 Great Skuas were impressive and a Leach's Storm Petrel and 21 Little Auks bode well for the following morning. Little Auks totalled 21 on 27th and 105 on 28th (Jeff Cox). The strong overnight wind had shifted to the north-east by Sunday morning 28 October, becoming east-north-east by midday. Viewing opportunities improved throughout the morning as many birds flew past close inshore. 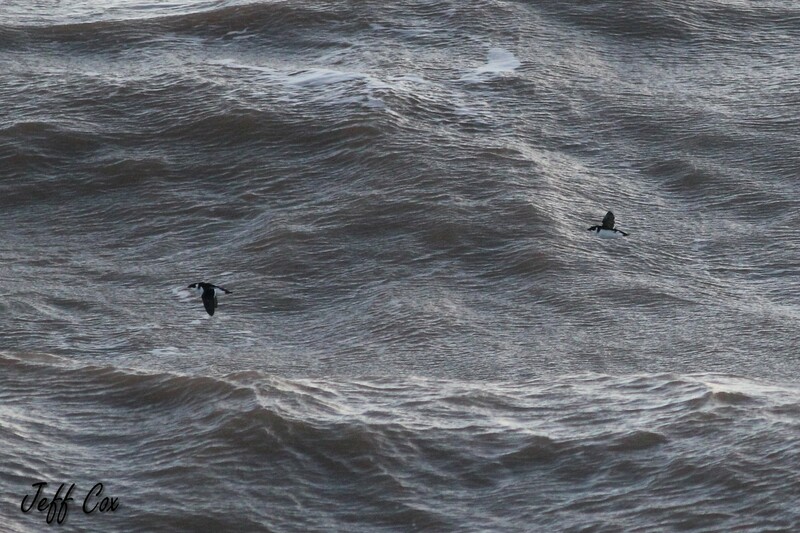 Relatively few Pomarine Skuas were recorded in these conditions, with just 22 birds passing north. Little Auks, on the other hand, were very much in evidence and throughout the day 105 birds were recorded, mainly heading north, with some birds landing on the sea. Grey Phalaropes too featured well with no fewer than four birds seen, including a close individual feeding and resting on the sea. 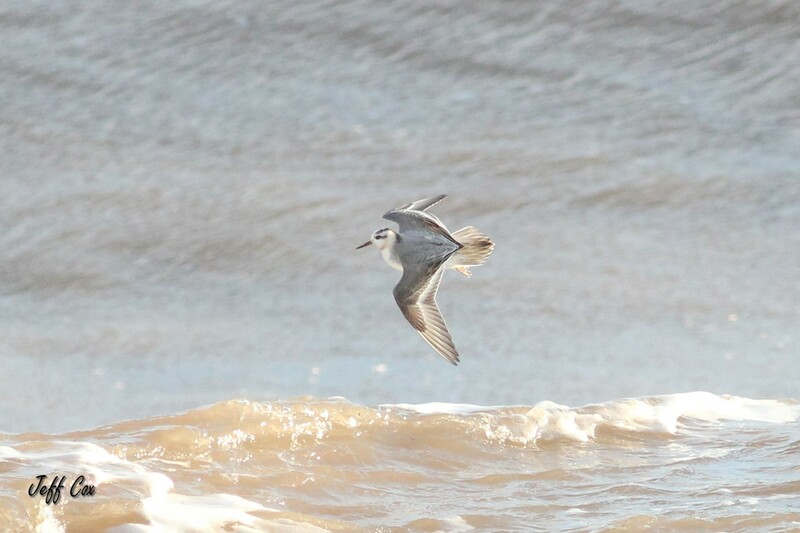 A minimum of four Grey Phalaropes passed on 28th, including a close individual that rested on the sea (Jeff Cox). However, there was more to follow and the icing on the cake involved three unexpected species. The first of these was a fine White-billed Diver in almost full breeding plumage passing north at 07:38. Later in the morning, an immature drake King Eider passed north at close range at 10:39. Thirdly, an adult Black Guillemot in winter plumage flew north at 15:48. Overall, two days of intensive seawatching (a further 6.5 hours were spent scanning on 28th) really paid dividends, with some impressive totals involved. These included five Leach's Storm Petrels, European Storm Petrel, Long-tailed Skua, five Great Northern Divers, four Black-throated Divers, two Red-necked Grebes, Sooty Shearwater and 110 Little Gulls. A handful of Leach's Storm Petrels passed by (Steve Young). Wildfowl, mainly moving north over the two days, featured strongly and involved 19 Brent Goose, 197 Common Eider, 1,786 Common Scoter and 10 Velvet Scoter, 549 Eurasian Wigeon, 745 Eurasian Teal, eight Long-tailed Duck, nine Tufted Duck, Greater Scaup, 28 Common Goldeneye, Goosander and four Red-breasted Merganser. Incoming Common Starlings reached 2,200 birds over the two days, with a Snow Bunting, six Short-eared Owls and a Peregrine Falcon also arriving for good measure. Excellent numbers of wildfowl were on the move over the two days, including Common Scoter (top) and Eurasian Teal (Jeff Cox). I'd like to thank Glyn Sellors, Richard Pittam and Garry Rowe for all their observations and support plus Steve Rogers of South West Optics for all his helpful advice. I certainly found that the Swarovski BTX 95 Binocular Telescope exceeded all expectations in the conditions.